13 | December | 2010 | Through the seasons before us.. Weather woes and a transfer rumour..
A frustrating couple of weeks for someone who likes to offload his urge to write on topics covering Forest, but there are a few things worthy of comment that have occurred in lieu of us actually playing games of football. The latest words of Billy Davies are covered well by Eighteensixtyfive – to be honest, he didn’t say much we’ve not heard him say before (several times over! ), but he does seem somehow more content (albeit still very defensive). The weather seems to be conducting a vendetta against us utilising our short-term loan of Aaron Ramsey from Arsenal – the poor lad will have hoped to have had more than a half-hour run out by this point in his Forest career. On the flip-side, given Arsenal’s desire to get him fit and in contention for re-challenging for his place in the Gunners line-up, it might give us the opportunity to extend his loan once we get to the January transfer window. Our game against Crystal Palace could be brought into question this coming weekend too – with more heavy snowfall forecast between now and then. 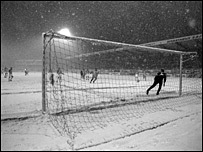 Hopefully Rushcliffe Borough Council will see fit to chuck some grit around the place to enable the game to go ahead, because missing out on three consecutive matches will see some real fixture congestion for us post-Christmas – which is never ideal! Either way, I blame Des the weather man. He is from Derby, afterall! Whilst we’re on transfer windows, with nearly half of December out the way thoughts will naturally be turning to the opening of January’s transfer window. Traditionally not a happy hunting ground for the Reds, and rumours are already starting apace. The most persistent one, and an exciting one if true, being that we are looking to sign prolific goalscorer Steven Morrison from Millwall. Of course, subject to the usual caveats when it comes to transfer rumours! If it’s true then a really exciting prospect – he impressed when Millwall came to our place earlier in the season and his goalscoring record is certainly covetable. Finally you have one more day to win a DVD of the 1959 FA Cup final courtesy of Tikabooson – make sure you take your chance to net this great prize! The deadline is noon tomorrow.